Native pollinators, and bees especially, are often overlooked beneficial insects. 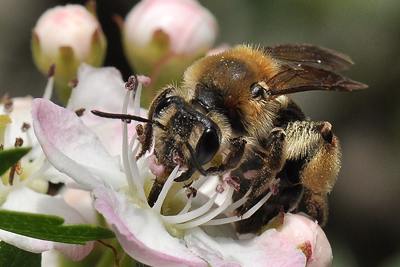 Research indicates that natives are better than introduced honeybees in SO MANY WAYS! Learn to take care of your native helpers and you will be rewarded many times over. Many natives are ground-nesters, so make sure to leave undisturbed patches of bare sandy soil – that’s where they excavate nest chambers – and leave plenty of protective cover around plants for overwintering insects. Some pollinators make nests in hollow twigs and other cavities, so there are lots of places to look for them in your own garden and landscape.